We’ve got chocolate on the brain, as anyone who follows our Twitter feed might have noticed. We just got back from a sneak preview of a new chocolate exhibit opening today at Muzeo in Anaheim and now we can’t stop thinking about chocolate in all of its luscious, creamy cocoa-y deliciousness. Chocolate is an incredible food, when you get down to it. It’s almost universally craved by kids and adults alike (we have a little guy who when asked what he wants on his pizza, declares, “Chocolate!”). It’s coveted not only for its versatility in cooking but also its health benefits (more on that in a minute). Plus it’s got an amazing history that spans the globe throughout the centuries. So…if you think of chocolate as just a bar that comes in a shiny wrapper, you need to give it another look. 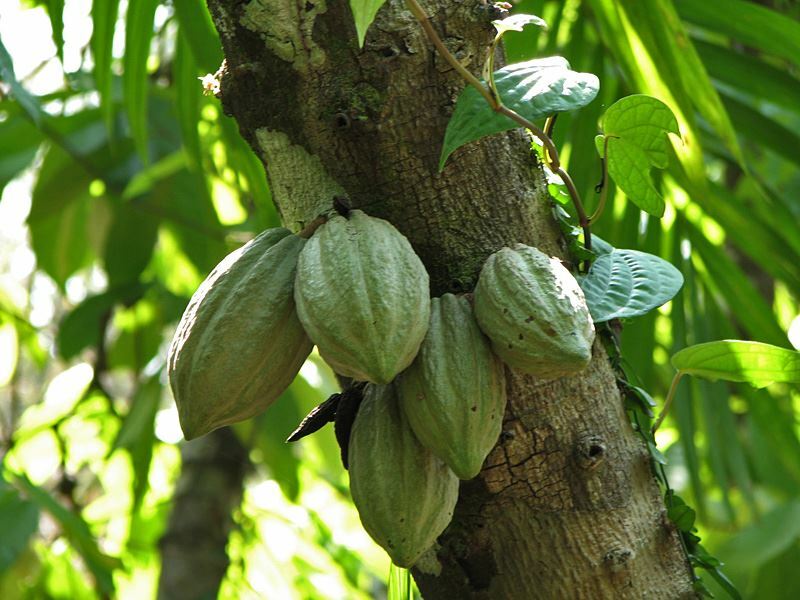 As we learned at the exhibition (part of a national tour developed by the Field Museum of Chicago and sponsored in part by the National Science Foundation) cacao was first domesticated between about 1800 and 300 BCE. Although we tend to think of chocolate as a solid today, for 90% of its history it was consumed in liquid form. 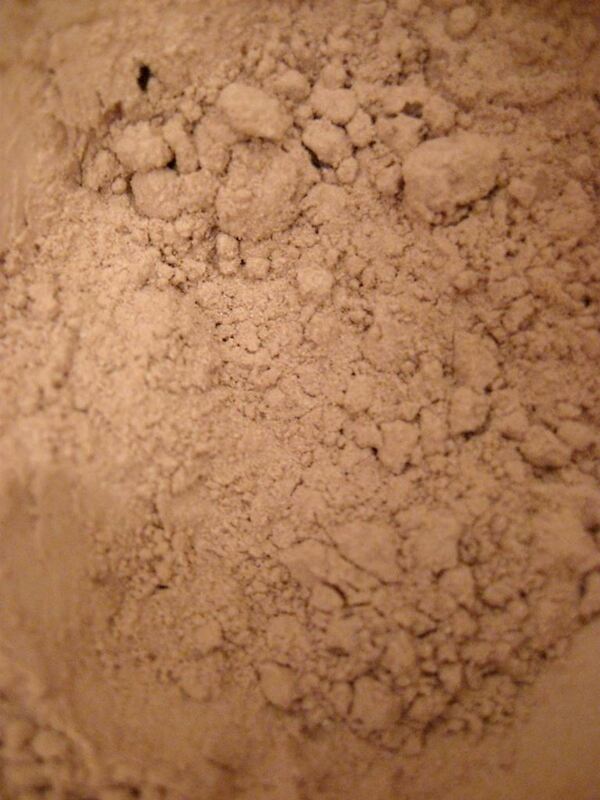 The ancient Mayan people of Mexico and Central America, for example, consumed it as a spicy drink. It wasn’t until the 16th century that the Spanish, who found cacao while searching for gold in the New World, added sugar to make it a sweet food. 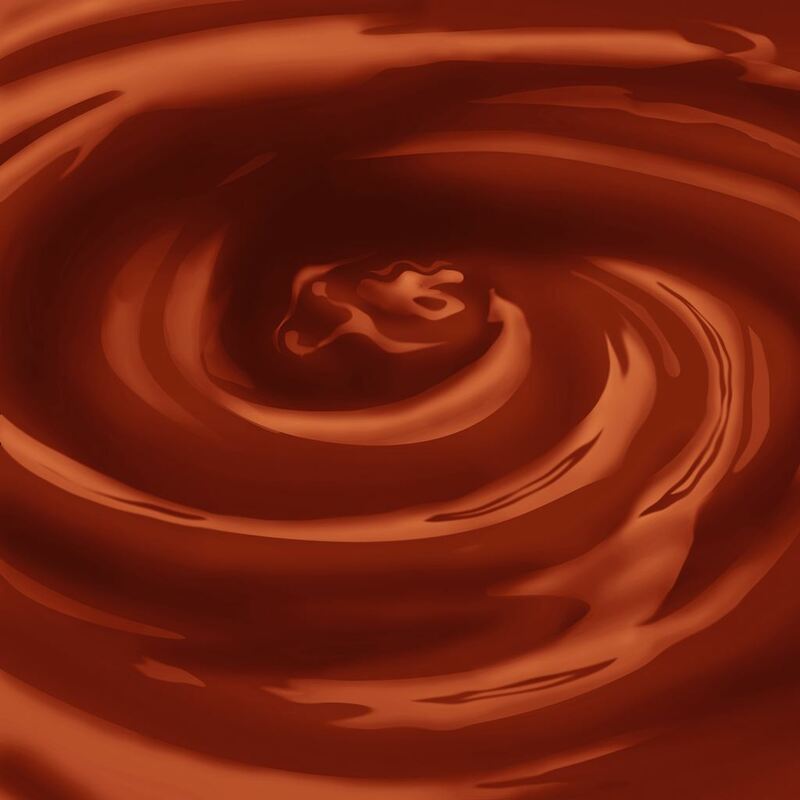 As the chocolate craze swept Europe in the late 17th and 18th centuries, the Italians began experimenting with it and used it to flavor everything from soup to polenta — even dipping liver in chocolate and frying it (it is absolutely killing us not to have a picture of this). In 1828 a Dutch chemist invented the cocoa press, which extracts cocoa butter from chocolate leaving the cocoa powder behind – and the industrial age of chocolate production began. 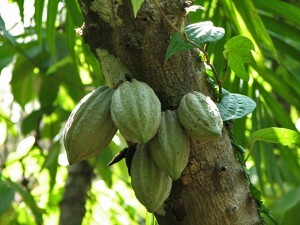 Cacao seeds (pictured in their seed pods) contain the chemicals caffeine and theobromine, which give them a bitter taste. They also contain significant amounts of naturally occurring flavonoids (substances also found in red wine, green tea, and fruits and vegetables), which are associated with a reduced risk of cardiovascular disease and some cancers. However, commercially produced chocolate also carries a heavy load of saturated fats and calories, so there are certainly healthier ways to get the same benefits. If you’re going to eat chocolate, dark chocolate is the way to go. Dark chocolate has fewer calories, less saturated fat, and twice as many antioxidants as milk chocolate. If your kids are like ours, they are probably used to the super-sweet taste of milk chocolate. One way we got them interested in dark chocolate was to serve this power snack mix – the only rule being that they have to eat all of it, not just the chocolate pieces. 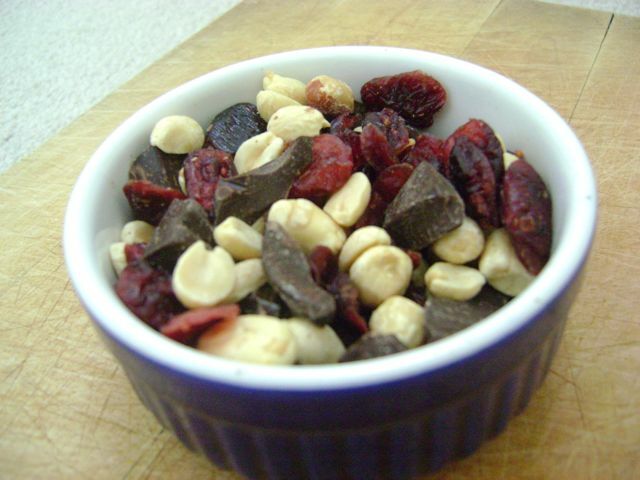 Combine all three ingredients in a bowl. Serves 4. Note: Most stores sell dark chocolate chunks in the baking section; if you can’t find them, break a dark chocolate bar into small pieces. At dinnertime, you can introduce your kids to a savory chocolate dish such as mole sauce. 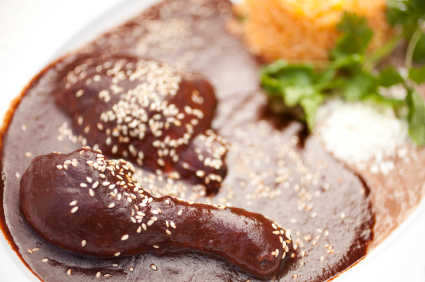 Most mole sauces have a tomato base and have a rich, dense spice mixture. We like this step-by-step version over at Casual Kitchen. You can also try this classic mole from Rick Bayless or this much easier version from Fork Fingers Chopsticks. Melt chocolate in a medium, heatproof bowl over hot water. Stir often, until almost smooth. Then remove from heat and whisk until completely smooth. In a small, heavy-bottomed saucepan, combine milk, cream, and sugar. Warm over low heat, stirring often, just to simmer. 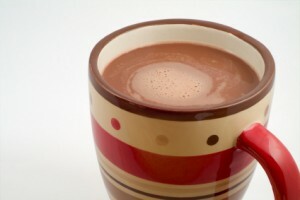 Quickly stir in coffee to dissolve, and remove from heat. Add a small amount of the hot liquid to the melted chocolate, whisking in well until smooth. (If the chocolate “seizes” and refuses to smooth out, try adding a bit more liquid.) Very gradually add the remaining hot liquid, whisking until smooth after each addition. Scrape the bowl occasionally with a rubber spatula. If necessary, return to pot and reheat over low heat, stirring often, until very hot. Stir in vanilla and serve at once. If you’re in Southern California, check out the chocolate exhibit at Muzeo: 241 S. Anaheim Blvd. in downtown Anaheim; 10 am to 5 pm daily; $13 for adults, $9 for children 12 and under; ages 3 and under are free. The exhibit runs through September 11. Thanks, Valentina! I didn’t bring the kids to the museum yesterday but we had a big taste test last night (maybe a little too late – my mistake). I’m going to bring the whole family back on July 30 when Muzeo will host an all-day chocolate festival in downtown Anaheim to go along with the exhibit.